Ruthlessness, on the other hand, is a trait that our Nobunaga possesses in similar excess to his historical counterpart, and he and his brother corner and crush the single Ikko-Ikki unit that managed to escape from Okehazama. Knowing how the AI plays, though, it would have just run around my territory raiding farms until I killed it anyway. Further good omens come as we learn that war has erupted between the Mori and the Ikko-Ikki. With luck, this will keep the remaining Ikko-Ikki armies occupied while we scoop up their undefended territories around Kyoto. On the other side of our domain, the Satomi – whom you may recall as the clan that overthrew their Hojo overlords and retook their home province of Kazusa and then swiftly conquered the rest of the Hojo holdings â€" has decided to rekindle the old Hojo tradition known as “complete stupidity” and declare war on us. They march on Edo with a debatably-superior army to Nobuhide’s garrison, but I’m able to scramble some reinforcements from Sagami before they reach the castle. I hate playing siege battles if I can help it, because honestly, I find the fortifications more of a hindrance than a help, but it’s been a long time since I played one in this campaign and I could swear that at least a few of you have been asking to see one, so here’s a brief look. The enemy has a lot more archers than I do, and they’re mostly samurai, which should win outright against my inferior ashigaru. So the general deployment strategy I’m using here is to keep all of my bows on the walls where they can do the most damage, and the rest of my units are sitting in a big, loose blob in one corner of the castle. Hopefully, this will prevent my melee units from taking very many casualties while my archers soak up the enemy fire. The AI tends to deploy its forces erratically during sieges, attacking from multiple angles with subgroupings that may or may not make sense. Sometimes it puts all of its bows together with absolutely no melee support. Sometimes it deploys its forces sensibly, but leaves all of its generals on the other side of the map for the entire fight. And it doesn’t seem to know what gates are, preferring to have all of its men climb ten meter tall, seventy-degree inclined walls â€" a climb that usually kills ten or twenty men in each unit even if they aren’t under fire. This is even more ridiculous since any melee unit can spontaneously generate an infinite supply of Molotov-cocktails or torches or whatever and throw them at a gate until it catches fire and burns down, leaving the way open for them without requiring a precarious climb over a giant wall and a fight with all the defenders at the top. But whatever. My opponent hammers at my archers and sends most of his melee units at my walls. Every time a melee unit makes it to the top, I pull back the nearest bow unit from the walls and send one of my melee units to deal with them. This is another area where the siege AI doesn’t really play sensibly. The defender has a significant advantage when fighting inside the castle, particularly on the innermost level of it (or the entire castle in this case, since it has only one level), because any defending units near the keep will almost always fight to the death â€" that is, they won’t ever rout, and the attacker will usually need to destroy them outright. This means that even a cheap, vanilla yari ashigaru can be a threat to a katana samurai â€" all it has to do is kill enough of the samurai for them to rout, and its own numbers aren’t a concern as long as it isn’t destroyed completely. To boil all of this mechanics discussion down to a single point, this means that in a situation like this, where the attacker has massive archer superiority, the best thing to do is to hold its melee units in reserve and use its archers to destroy first the enemy archers, and then all of the melee units hiding inside the castle that they can before they run out of ammo. Instead, the AI rushes its melee units in first, and they’re all slaughtered. Even if I wasn’t winning the infantry battle handily, I still have this detached force of reinforcements from Sagami. I’ve been marching them to engage the enemy bows, and I’ve detached two melee units from the castle garrison to engage the enemy as well. And this is where my problem with siege battles really comes from. The AI has already lost most of its infantry, and the strength it has remaining is composed almost entirely of bow samurai and generals’ bodyguards. If this were a normal, open field battle, I would have won this already â€" all I’d need to do is charge my infantry into their archers and they’d rout in seconds. But despite the fact that the enemy can climb up the walls and come directly at me, I can’t climb down the walls and charge directly at them. Instead I have to detour my units out gates and risk getting them caught in a chokepoint â€" which the AI, for all of its bemusing behavior, can sometimes manage to take advantage of. Castles make me feel more trapped than safe. Anyway, my flanking force wraps around, routs one group of bows, and slams into the second, drawing the enemy generals into the fray. There’s a little concern for me as one general manages to get around my spearmen and hit the bows that were part of the reinforcements, but it doesn’t ultimately prove to be much of a problem. Soon, most of the enemy force is routed and victory is assured. I come away with a Pyrrhic Victory, mostly because the reinforcements and the units I sallied out of the castle to assist them got pretty banged up, along with my archers. But unit replenishment being the way it is in this game (that is, incredibly fast), it probably won’t be much of a problem after a few turns. In much graver news, the other shoe has finally dropped â€" the Mori have declared war on us. They’re the most powerful clan in Japan by far, and worse, they’re the premiere naval power on the island. I haven’t even built a single ship in this campaign. My hope was that I could stave off a Mori naval invasion through diplomacy until I had a proper naval force built up. That is now going to be difficult. And honestly, even with a proper fleet, I may lose to the Mori’s sheer numbers. But there is one way I could guarantee a victory against them: European ships. But I won’t be able to built the so called Nanban Trade Ships unless I convert to Christianity. It’s decision time. On the one hand, converting to Christianity will quickly lead to massive unhappiness in our non-Christian population (read: everybody), and will cause a severe hit to our diplomatic relations. Additionally, converting to Christianity will hurt Nobuhide’s honor, which will cause even more unhappiness and could very well crash our economy. It will also stop our assault on Kyoto in its tracks because there is no way I’m going into realm divide with half of my provinces on the verge of revolt. On the other hand, can I really pass up the chance to troll history with a victorious, Christian Oda Nobunaga? Nobunaga and Nobuyuki march further east to conquer the province of Yamato. They are, predictably, victorious. This should provide a small boost to our income, at least initially. I’m close enough to initiate trade with the Ashikaga Shogunate itself. It won’t last very long, but every little bit counts. Put points into the honorable trait in his upgrade tree. This works out perfectly for us. See, Daimyo have a unique trait called honor that subtly affects things like diplomatic relations and such. The base honor level is three, but if it drops to two or below, your people will be very unhappy. Converting to Christianity reduces your Daimyo’s honor by two, enough to cause a lot of unhappiness amongst your population â€" something you don’t want on top of the unhappiness your unconverted population will already be generating. But with honorable, I can increase Nobuhide’s honor by two â€" effectively equalizing what I’m about to lose by converting to Christianity, and saving us a lot of headaches in the future. Nobuyuki continues north and takes Iga, the original home province of the Hattori (our allies from the beginning that were wiped out by the Hatakeyama). We now control a good deal of land bordering Kyoto, and we only need Omi to complete the picture. Taking Omi will trigger Realm Divide, however, so we’ll hold off on that for now. All right, it’s time to take the plunge. Well, there we go. No turning back now. In reality, of course, neither Nobuhide nor Nobunaga ever converted to Christianity, but Nobunaga was quite interested in European culture, and was very generous towards the Jesuit missionaries that had been coming to Japan since the beginning of European contact. He even helped to establish the first Christian church in Kyoto. And if he had seen conversion to Christianity as the only way to move forward with his ambitions, I suspect he might have. But that’s history. Our version of Nobunaga is fantasy, and only time will tell if this decision will lead us to victory, or disaster. And now Oda “Cuthbert” Nobunaga has decided to prove once and for all, that History will not prevent his drink inspired rampage across Japan. His recent Conversion to Christinaty was surely brought about by them offering him an obscure little drink called whiskey, and promising one day a Rose will teach his family to bring about its true potential. Not wanting to wait that long, he skulled it down and is now provoking the Mori in the hopes of turning their trading fleet into his travelling Keg Party. 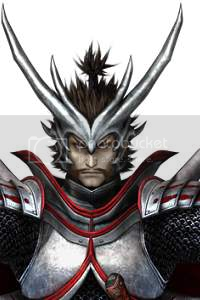 Speaking of which, I actually tried making a little something using the Sengoku Basara version of Nobunaga (which fits the Cuftbert character well enough). Unfortunately I couldn’t find a better picture so this is as close as I could make it. As always, an interesting mash of strange AI quirks and complete historical inaccuracy. Well done. Probably the worst AI quirk of all time was in Rome. You see, the wonderful people doing the AI programming split the AI into 2 sections. A diplomatic AI, and a military AI (which kinda makes sense). They then made it so that you were allowed to attack Allies with no warning whatsoever. 1) You ally with X, using the diplomatic AI. 2) You strip the border with X, because they’re your ally. 3) The military AI goes “OOH, undefended border” and attacks. 4) The diplomatic AI gets very, very drunk. Pretty soon, you discover that having alliances is really incredibly worthless, and that diplomacy is incredibly pointless beyond some of the trading rights stuff. Great stuff, I always look forward to these “let’s plays”! Just a small thing, a tiny thing, an absolutely minuscule comment; you spelt ‘honour’ wrong. A lot. I know that’s how you guys spell it across the pond, but the game spells it ‘honour’, so it’s a bit de-syncronous to call it ‘honor’. Oooo I do love to nitpick other people’s hard work for trivial reasons that don’t matter! It makes me feel like I contribute to the world, rather than the reality of just doing it to be a jerk! Sorry Josh, anyway love this series, please keep it up! Well, I certainly hope that doesn’t color your opinion of Josh’s little theater here. You were bothered by that but were okay with “rekindle the tradition alive”? After Medieval 2 they never really managed to make siege battles interesting for me. The siege battles in Empire total war were specially annoying and stupid so the ones in Shogun 2 I find to be a small improvement. Siege battles in Empire are a *real* pain. Especially since the attacker (usually you) gets the deployment zone of a small stamp when the defenders decide to sally forth, even though *the defenders* are the ones being besieged. …And now that you are Christian, you will magically be given the blueprints to make boats with cannon, which you will never be able to replicate if you convert back to shinto-buddhism. Yeah, I have no idea how that works either. Best of luck with the ensuing rebellions, especially since you’ll be pummeling your already fragile economy further just to pay your guards. Better get churches set up quick. By the way, I note you updated to the new patch half-way through Nobunaga’s rampage through the central lands. Anything new in that patch of note? I haven’t played Shogun much lately. Clearly the blueprints are a gift from God. But it does make a sort of sense. I’m suffering through a cold, so I might not be all there. Or rather more than usual might be somewhere else. From what I’ve heard Japan doesn’t have a lot of iron, so they had to import cannons. The Europeans could be refusing to sell them unless you’re Christian. Don’t know if it’s historically accurate, or if it actually makes sense to refuse to sell just because somewhere far away and therefore unlikely to go to war with you anyway isn’t the same religion as you. I think it’s more a balancing issue in that case. Requiring converting first makes some sense, as the Europeans would unlikely be willing to just hand over their most advanced technology to those of a different faith. I think it’s more a question of giving a player an incentive to convert in the first place, given the trouble it’ll cause you — in real life the Europeans sold both arquebus and cannon to anyone who could afford them regardless of religion, and lent shipwrights who taught the Japanese how to make European-style trade ships. And, incidentally, arquebuses are more advanced technologically than a cannon by about 200 years, give or take. Although even if your trading with them by sea, you might want to keep the floating gun batteries to yourself, in case they turned against you for whatever reason. Sorry to be a bother, but can you go back and tag the old posts so I can read this series through? The “Josh plays” tag only goes from part 15 to now. search “shogun 2”. That brings up almost only these since shamus hasn’t ever done any shogun or even total war stuff. Go to Lets Play category. Ctrl-F. Type “Josh Plays” All of the posts are now revealed to you. While I know you’re at PAX and probably can’t edit, I think you mixed your euphemisms up there – you either rekindle an ancient tradition, or keep it alive. I don’t think you rekindle it alive. Unless it’s a phoenix tradition. There are traditions that don’t involve arson? Not when Josh is involved there aren’t. Well, this IS Josh we’re talking about. Bah. This is what happens when I’m rushing to post something an hour before I get in a taxi to go to the airport to go meet Shamus and sneak grenades into his pants. BUT NOW IT IS THE FIXED. Aw, I was hoping it would stay broken until you got back. NANBAN TRADE SHIP RAMPAGE COMING!!! These ships are totally broken. With a single of these, while being careful, you can wipe a 12-ships fleet with minimal damage. As someone who has never played Shogun 2, I must say that I’m interested in seeing one of these ships in action, especially with the praise that others keep lauding on them. What about the Nanban makes it so much better than the other ships? Is it faster, or does it just have a flat stat boost? Does Jesus suddenly appear above it and shoot holy laser beams from his hands (and feet) at enemy ships? There are only three ships in the game with Empire-style cannons; those being the Black Ship, Nanban trade ships, and the late-game cannon bune. Excepting those, all other Shogun ships use arrows/arquebuses and boarding actions, and cannon ships will usually demolish all other ships before they get in range to do that kind of harm. Demolish or demoralize ships. If lucky, it can take only a single volley to kill/crush a ship’s moral. Otherwise, maybe up to 3 volleys. Also, the ship has independant rate of fires on both sides. So if you position your ship well, you will wreak twice as much havoc. Also, your ship has a large complement of matchlock troopers who will davastate unprotected crew members of other ships, wich a rather high rate of fire. Edit: And I forgot. The cannons have a very, very, very long range. Something like 10 times the range of regular ship’s arrows. So you start hammering them early on in the fight. Actually, this is historically correct. When European ships first appeared on the Pacific and Indian Ocean, it was not uncommon for small fleets (3-4 European ships) to defeat large armadas (hundreds of ships) of the natives. See wikipedia for some examples. The main difference was that the European ships had longer range weapons (cannons and arquebus), were capable of sailing in more adverse weather conditions (they were capable of oceanic travel, whereas most ships they faced were coastal), European ships were more manoeuvrable, the European crews were more experienced (by the time they reached the Indian Ocean, they already had at least a year of oceanic sailing), and the deck of the European ships was much higher than the natives’, which made boarding (a widely used tactic at the time) very difficult. -sigh- my copy of shogun 2 hasn’t worked since the FoTS patch. sad day. But still fun to read and i can kinda of enjoy it vicariously if nothing else. I’ve said before seige battles are kinda broken in a few ways, i like being the defender, i hate being the attacker. but from what i’ve heard they’re better that the other total war games. the navy battles though… they’re just fail. So, good luck with that. Can you switch back? I mean, in the interests of having all options open in the cutthroat politics department, that would seem logical. Plus, it’s not like Christianity was an irreversible wave in Japan–even to this day, it seems like the Japanese are basically secular with a sprinkling of (whatever religion seems to have the best stuff for this particular special occasion–a lot of Christian for weddings ’cause they like the nice dress, but Shinto for new year etc). If you can switch back, you could go Christian long enough to grab a big boat or two, then reverse course in time to take the wind out of the sails of some of the peasant unrest. Presumably honour would take even more of a hit, but it might be worth it on balance, especially if you were going to trigger realm divide and have everyone hate you anyway. Well, Oda Nobuhide died of natural causes in my game, the same may happen in Josh’s game. From what I’ve understood a big part of why Japanese do Christian/western weddings is because the traditional Shinto weddings are really expensive. So, Josh, seeing as you hate this game’s way of handling siege warfare, what would you change? The AI is amusingly terrible at dealing with them, I agree, but what would you change from a mechanical standpoint to make them less predictable/more interesting/both? This should be fun – as the Chosokabe, my early conversion to Christianity was economically painful but since many of the Shikoku residents were already Christian, I had a solid power base that wasn’t in danger of revolt. It’ll be interesting to start from scratch. Josh, what are the chances that we’ll get to see a Fall of the Samurai playthrough when you’re done with this one? I’m enjoying this playthrough immensely, but after playing Fall myself I’m interested to see your take on it. Josh is going to become a Christian Shogun, using largely peasant armies armed with Western firearms. What makes you think we’re not already seeing a Fall of the Samurai playthrough?